60% make between 4,000 and 8,000 gns. 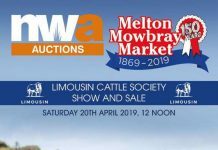 The terrific year for British Limousin Cattle Society sales moved into its final period on Saturday 14 October at Borderway Mart, Carlisle, with the annual autumn show and sale of bulls. A packed ring saw 113 bulls sold to an average of £7,018.27, up on the year by an impressive £914.10 for 20 more bulls sold with a clearance rate of 77% of the 146 bulls forward. It was a sale that saw something to spark everyone’s attention. While the breeder’s bulls hit some headline prices, once again commercial producers were out in force showing their keen demand the breed. Fourteen bulls made five figures or more, with 35 in all making 7000gns or more. Some 60% of the bulls forward sold for between 4,000 and 8,000gns, and again highlighted the depth of trade coming from the commercial side of the business. 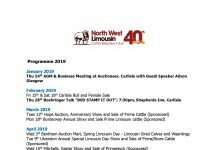 Commenting on the sale BLCS Chief Executive Iain Kerr said: “There has been a strong demand for Limousin bulls throughout 2017 and it was great to see that continue at the Society’s October Sale with increased numbers sold and averages well up. 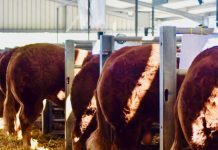 Commercial buyers again underpinned the trade and a feature of the day was the emphasis they were placing on bulls that had good calving figures along with length, shape and good tops. 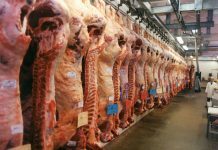 Beef producers are looking for easy calving, easy care cattle that are feed efficient and producing high end suckled calves with tremendous carcase attributes. 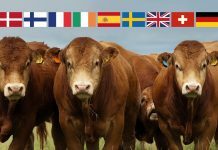 The Limousin breed is synonymous with these traits and that’s what is driving the continued and increased demand around the UK”. In a remarkable statistic the five leading sale prices on the day all featured Ampertaine breeding either as the sire or dam. 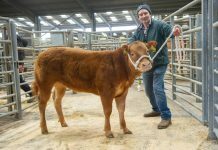 Later in the sale James McKay also sold the July 2016 born Ampertaine Morton an Ampertaine Jamboree son out of another Abracadabra daughter, Ampertaine Eve, for 9000gns to the Longhirst herd of JE Jordon & Son, Morpeth, Northumberland. Selling at 28,000gns was the pre-sale show Intermediate and Reserve Overall Supreme Champion, Sarkley Moray from Messrs E H Pennie & Sons, Powys. The April 2016 born calf is one of the first sons to be offered for sale by the 13,000gns Ampertaine Interest. His dam Sarkley Hosanna is a very smart daughter of Sarkley Oriana who was a prolific show winner through 1999 and 2000. 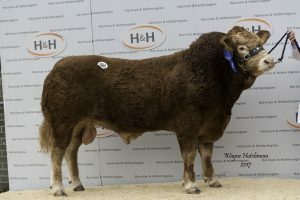 In a half share purchase arrangement he was knocked down to G J Lee & C M Lloyd for their Calogale herd, Kidwelly, Carmarthenshire and A H & K J Booth, for their Sevengun herd at Hardwick Hall Farm, Aston, Sheffield. 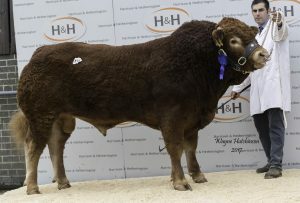 After the show the day earlier Judge Mr Hazard remarked that he was a “quality carcase bull with good locomotion that had performed particularly well in the ring”. He added that “he could see him doing well in either a pedigree or commercial herd”. 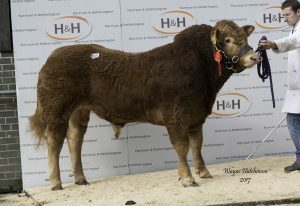 Three bulls sold at 20,000gns, the first being Gorrycam Major from Gorrycam Limousins, Newry, Co Down, Northern Ireland. A bull with style and muscle Major is by Ampertaine Elgin and is out of Gorrycam Dolly. He is maternal brother to Gorrycam Hunter who made 28,000gns at Carlisle back in October 2013. The bloodline has also produced Gorrycam Diana who sold to 18,000gns and the 26,000gns Gorrycam Hazard. He went home to the Liscon herd of J Mulholland, Midtown Farm, Great Orton, Carlisle. As well as a commercial herd the Mulholland family run a traditional butchers shop in Great Orton. They have a 50 year heritage of supplying fresh beef to local residents and restaurants and pubs across Cumbria. Next up at 20,000gns was the June 2016 born Ballinloan Mountain from Stuart Fotheringham, Dunkeld, Perth and Kinross. By the noted Wilodge Cerberus son Ampertaine Foreman, and out of Ballinloan Gaga, he came to Carlisle having been shown successfully over the summer. At the Royal Highland Show he stood as Reserve Overall Beef Breeder Champion, plus he took the Breed Champion spot and Reserve Interbreed Champion at the Perth Show. 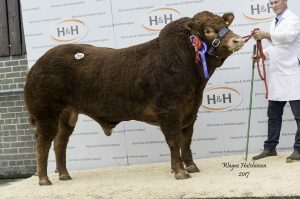 This bull was sold to Albert Howie for his Knock herd at Stuartfield, Peterhead, Aberdeenshire with Stuart Fotheringham retaining a half share. 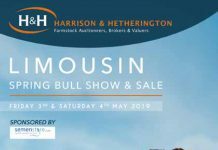 When the hammer went down on this bull it added to what had already been a successful trip to Carlisle for the Fotheringham family. 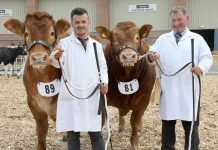 They had won “The Carlisle Three” Award for the best pen of three fully performance recorded home bred bulls in the pre-sale show the day earlier with a team consisting of Ballinloan Mountain, Marshmallow and Master, all of whom were sired by Ampertaine Foreman. On the day, the judge Duncan Hazard praised the “impressive balance” throughout the group. In the sale, Ballinloan Marshmallow was knocked down for 7,000gns to Woodman & Son, Haltwhistle, Northumberland while Master made 12,000gns in selling to D R Owen & Son from Tywyn, Gwynedd. 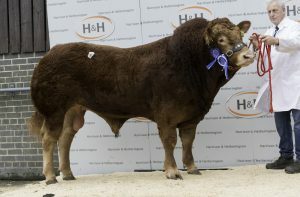 The third bull to make 20,000gns was the June 2016 born Grahams Michael from R & J Graham, Bridge of Allan Stirling, who had been tapped out as the Reserve Junior Champion in the pre-sale show. He was another who came for sale on the back of a successful summer on the show circuit. An embryo calf out of the noted show cow Millbrook Gingerspice, and sired by the well-known sire Ampertaine Elgin he stood as the Limousin Supreme Junior Bull and the overall Supreme Bull at the Royal Highland Show earlier in the year. 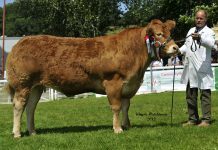 In a share purchase arrangement he was sold to E W Quick & Sons for their Loosebeare herd in Devon and Messrs Ridley for their Haltcliffe herd in Wigton, Cumbria. Later in the sale the hammer went down at 14,000gns for Grahams Mungo, also from R & J Graham. This May 2016 born bull, by Kilcor Iceman out of Galipette, was knocked down to T W Roberts, Malthouse Farm, Cardiff. 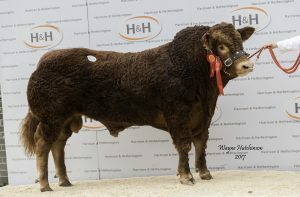 Next in the pecking order of top prices was a bull from Messrs Ridley in the shape of Haltcliffe Matthew at 16,000gns. This May 2016 calf is by the French bred Ducasse and is out of Haltcliffe Hello, a Haltcliffe Vermount daughter. He went home with R S Harker & Son, to their Honeymoor herd at Grayrigg Hall, Grayrigg, Kendal. Of the three lots which made 15,000gns the first in the ring was another one from the Ridley team, Haltcliffe Mike. The March 2016 AI bull was described as a bull with ‘serious muscle’. 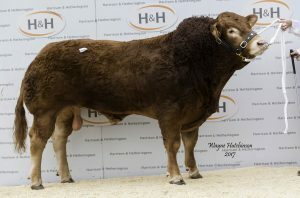 By Volcano out of Haltcliffe Igls he was knocked own to commercial producers J A Wood & Sons, Ratlinghope, Shrewsbury who have been regular buyers of Haltcliffe bulls over the years . 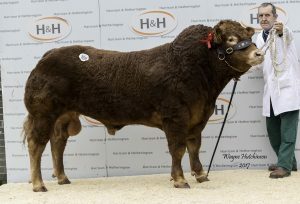 Also at 15,000gns was another from E H Pennie & Son, Powys in the shape of Sarkley Mercury. The April 2016 born calf, also by Ampertaine Interest, and out of Sarkley Halexine went home with Gary Bell. A first generation farmer Gary runs 165 suckler cows at Haas Side farm in Lockerbie. A firm “commercial man at heart” Limousin was his breed of choice when starting his farming enterprise because, in his own words “he believes they tick all the boxes when it comes to producing top quality calves and productive cows”. 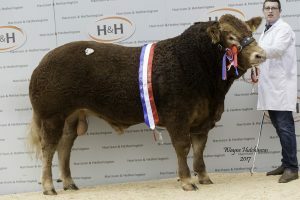 The third bull to make 15,000gns was the pre-sale show Supreme Champion Trueman Mozart, who in taking the title followed up his impressive haul at the Royal Ulster Balmoral Show, Belfast earlier this year where he stood Male Champion and Junior Interbreed Champion. The May 2016 born embryo calf from Henry Savage & Sons, Co Down, is the first bull by the 147,000gns world record price holder Trueman Jagger which was sold at Carlisle in October 2015. He was knocked down to A Padfield, Great Yarmouth, Norfolk. Mozart is out of Trueman Honey, herself a past Overall Reserve Supreme Champion at the Balmoral Show. In selecting him as Champion the day before Judge Mr Hazard commented that “he has tremendous width for his age, an impressive top line over the plates and enough muscle where it was needed”. For the Savages this was their third Supreme Championship at Carlisle within the last two years. Three bulls made the 12,000gns mark, the first of which being the aforementioned Ballinloan Master from Stephen Fotheringham. Accompanying him at this price mark was Barrons Mexeco from Willie Barron, Durham. By the herd sire Mereside Godolphin, and out of the stylish cow Barrons Echo he went home to the Norman herd of E S & E Norman, Little Orton, Carlisle. Mr Barron sold three bulls in all, all by the 40,000gns Mereside Godolphin to gross a very acceptable 26,800gns. Barrons Mrman sold for 7800gns whilst Barrons Milo made 7000gns. The third to make the 12,000gns price was Garnedd Max from the Jones family, Betws-Y-Coed, Conwy. 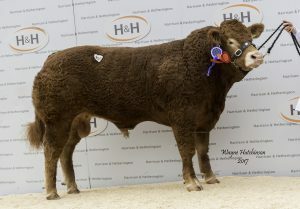 By the herd sire Trueman Idol, and out of Garnedd Heulwen, he made the trip north to the island of Orkney with Messrs R & J Johnson for their Hewan herd. The last lot to come in over five figures at 10,000gns was Scorboro Matrix from Jim Bloom, Decoy Farm, Driffield, East Yorkshire. The March 2016 bull by Fenomen out of Scorboro Evening comes from a very good dam line that combines positive EBV’s for calving, growth and docility with correctness and shape. He was bought by the Chatsworth Settlement, Bakewell, Derbyshire. 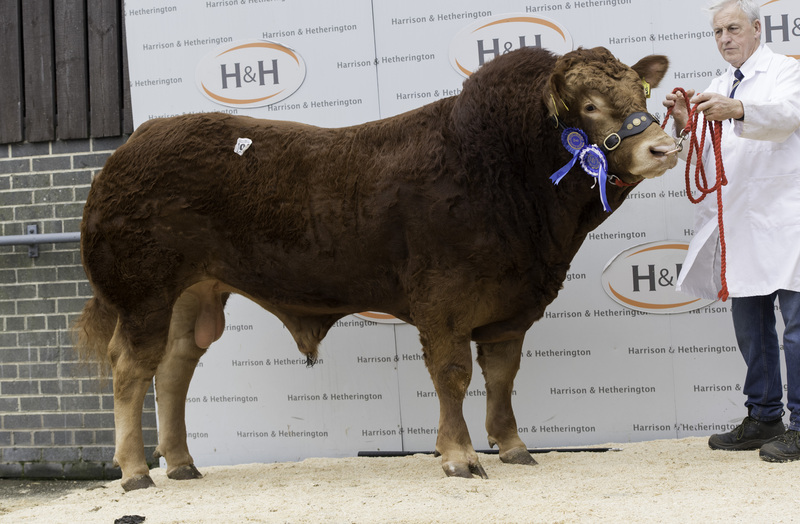 Enjoying a terrific day’s trading the Scorboro herd sold four bulls in all, with all sired by Fenomen, to gross 31,700gns. 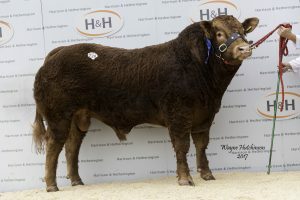 Other sales from the Scorboro pen saw Scorboro Magnum sell for 9000gns to NP Wilson, Moffat, Dumfriesshire; Scorboro Memphis for 6500gns; and Scorboro Mrbig for 6200gns. In an interesting first for the breed, the sale at Carlisle attracted some keen interest from a Spanish buyer in attendance, who, with an introduction and assistance from Andrew Ewing, Dumbretton Farms, Dumfries will be taking five bulls back to Spain at a total cost of 24,800gns. With a family history dating back several generations, D. Francisco Hernández Gutiérrez, his son and grandson run a herd of 300 Limousin cows in the Spanish province of Avil on their property Mingoblasco. Developing their herd over the past 30 years the strapline for the enterprise is “GENETICS AND QUALITY; SUCCESS”.